Today is Monday, November 7, the 312th day of 2016, with 54 days remaining. The United States Presidential Election is tomorrow. Today marks the midpoint of autumn in the northern hemisphere, and spring in the southern hemisphere. There are 17 days until Thanksgiving, 44 days to the winter solstice, 46 days until Festivus, and 48 days until Christmas Day. On this day in 1874, a cartoon by Thomas Nast in Harper's Weekly is considerd the first significant use of an elephant as a symbol for the United States Republican Party. According to history.com, Nast's drawing mocked the New York Herald, which had been critical of President Ulysses Grant's rumored bid for a third term, and portrayed various interest groups as animals, including an elephant labeled "the Republican vote," which was shown standing at the edge of a pit. 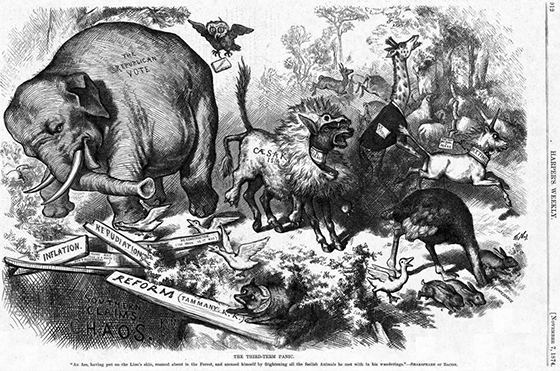 Nast employed the elephant to represent Republicans in additional cartoons during the 1870s, and by 1880 other cartoonists were using the creature to symbolize the party as well. Other election trivia: it wasn't until the 2000 election that the news media consistently adopted the use of red to represent Republican and blue to represent Democratic in maps and graphics. The Washington Post credits the late Tim Russert of NBC News with using the color designations on the October 30, 2000 broadcast of The Today Show. Prior to 2000, the traditional colors were reversed, according to Wikipedia. Among other things, today is also Job Action Day, sponsored by livecareer.com, a resume-building website. According to their website, the day is "designed to empower and inspire anyone looking to find a job, find more fulfillment in their work, or plan the next steps in their career." It mainly boils down to exposing yourself through various networking methods to as many potential employers as possible, the idea being somebody, somewhere has to be interested in you. Unless you're 62 and in the software field. A Florida man stripped naked and exposed himself to a 19-year-old female who was helping him register to vote. The man was arrested on charges of battery, indecent exposure, and false imprisionment. No word was given as to his party affiliation. A note on "Florida Man..." The media and bloggers like me probably wouldn't promote the subject of crazy sunshine state residents without being aided and abetted by the Florida news media itself. Take a look at a local newspaper, and odds are you won't see the name of the state in the headline of a story about bizarre behavior. Consider this old story from The Pittsburgh Post-Gazette: Police: Man tried to revive dead possum; alcohol involved. Note it doesn't say "Pennsylvania man." The person's residence isn't identified until the second paragraph, and then it's a local reference, "Brookville, Jefferson County." Stick "Pennsylvania Man" into Google, and note that most of the hits come from non-Pennsylvania media. Do the same with "Florida Man" and you'll see a number of Florida media outlets using the phrase in their headlines, as if they're actively seeking the attention. Humorist and Florida man Dave Barry once remarked that "Florida's number three industry, behind tourism and skin cancer, is voter fraud." "Florida man" stories must be running a close fourth. As of this writing, The KGB Quotations Database contains 41,105 entries. Check it out. Albert Camus, French philosopher, author, and journalist; Marie Curie, Polish and naturalized-French physicist and chemist who conducted pioneering research on radioactivity. She was the first woman to win a Nobel Prize, the first person and only woman to win twice, and the only person to win a Nobel Prize in two different sciences; Billy Graham, American Christian evangelist; Konrad Lorenz, Austrian zoologist, ethologist, and ornithologist; R.A. Lafferty, an American science fiction and fantasy writer; Herman Mankiewicz, American screenwriter, who, with Orson Welles, wrote the screenplay for Citizen Kane; Bryant H. McGill, author and activist; Joni Mitchell, Canadian singer-songwriter and painter. ; Tom Peters, American writer on business management practices; Viola Spolin, theatre academic, educator and acting coach; Judy Tenuta, American comedian; and Leon Trotsky, Marxist revolutionary and theorist, Soviet politician, and the founding leader of the Red Army. One of the reasons Clinton is so unpopular with white males, it is claimed, is termed the precarious manhood theory. Perhaps it's because I was raised by a strong woman (my grandmother), and came of age during the women's rights movement in the 70s, but I don't find strong women intimidating or emasculating. However, orange-haired delusional narcissists scare the bejeezus out of me. Physicists accidently discover a self-destruct button for the entire universe, but don't worry, it's something that can't be activated for billions of years... they think. The good news: scientists may have solved the mystery of the Bermuda Triangle. Bad news: it involves a meteorologic condition that can't be predicted and can only be detected by satellite imagery. The future won’t be decided by all of humanity, united under the banner of liberalism. It will be haphazard, and just as purposeless as the past. Trump is building a ‘psychographic’ profile of every voter in the country. I'm becoming more concerned over what Trump will say and do if he loses because, in Trumpland, The Donald never loses. A mystical Chinese monkey says Trump will win. Though her numbers are down from two weeks ago, Five Thirty Eight is still predicting Hillary as the winner. Militia groups around the country are getting reading for "trouble". As the most divisive presidential election in recent memory nears its conclusion, some armed militia groups are preparing for the possibility of a stolen election tomorrrow and civil unrest in the days following a victory by Clinton. Remember all that sniffing during the debates? A new report reveals that the rise of Nazi Germany was fueled by drug use. Hitler himself was taking 74 separate drugs, including a powerful opioid, and what we would consider today methamphetamine (crystal meth). Now it all makes sense. Ah, so it has a name... "social jet lag," a misalignment of biological and social time. I'm really a late night person. I function during the day, taking little naps, and rarely sleep more than four consecutive hours at a time, although that could be due to having older dogs with overactive bladders and a tendency to worry about paying the mortgage next month. Anyway, a group of scientists says society should make allowances for those of us who aren't really morning people.